South Africa’s new mariners’ regulatory institute calls for public input in development of its colours! 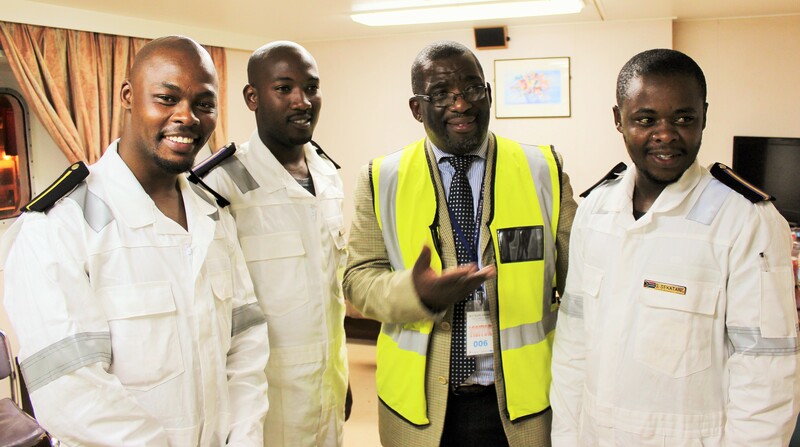 MARITIME MOVES: SA Maritime Safety Authority (SAMSA) CEO, Commander Tsietsi Mokhele (Second Right) with three of the country’s first set of learner seafarers to be placed on a South Africa registered commercial vessel, the Cape Orchid at Saldanha Bay in October 2015. The young cadets, (From Left) Samkelo Ndongeni (25), Thembani Mazingi (24) and (Far Right)m Gordon Sekatang; now have a dedicated professional regulatory institute to safeguard their professional interests inclusive of ongoing life long learning, the Institute of Professional SA Mariners (IPSAM). The institute of Professional SA Mariners (IPSAM) has embarked on a public campaign, through social media platforms, to solicit input on the development of its brand colours, logos and related matters pertaining to its formal establishment. IPSAM is a State approved governing body for professional mariners in South Africa established in terms of National Qualifications Framework Act. It gained formal government recognition and approval following to formalization of its establishment two years ago facilitated by the promulgation of the Merchant Shipping (Safe Manning, Training and Certification) Regulations 2013 that year. IPSAM is also calling for public input into a set of documents: its founding report due for submission to the SA Qualifications Authority (SAQA), a proposed Constitution, a Code of Ethics as well as disciplinary procedures for the organization. The public has until 31 November 2015, to submit responses. Posted on November 4, 2015 November 4, 2015 by sfayoPosted in Breaking News, Maritime Education, Training & Skills DevelopmentTagged Institute of Professional SA Mariners, IPSAM, maritime education and training, Merchant Shipping Regulations 2013, National Qualifications Framework, SA Maritime Safety Authority. Previous Previous post: SA Ocean Festival a star in the making! Get this!